Where you keep your money matters. When it comes to choosing a financial institution to house your money, you may need to decide between a bank vs. credit union. On the surface, banks and federal credit unions are quite similar. They both offer checking and savings accounts, mortgages, loans, and other financial products. However, there are quite a few important differences to keep in mind when deciding where to handle your financial needs. 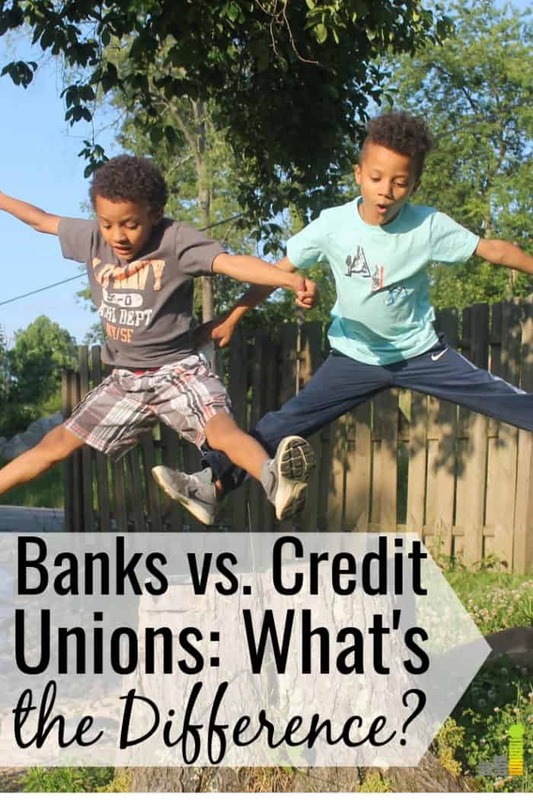 This post will highlight some key differences between a credit union vs. bank so you can determine which one is right for you. A commercial bank is a business that holds onto your money and creates a profit by investing the money or loaning it out to others. The bank also makes money by charging you account fees and ATM fees. Credit unions are member-focused institutions that operate as nonprofits. A checking account is commonly known as a ‘share draft’ because when you deposit money at a credit union, you actually buy shares of the company. With a federal credit union, instead of being a customer, you’re a partial owner. Credit unions offer many of the same services as a bank except, rather than feeling impersonal, there is a sense of community. It’s also common to find lower interest rates for loans. Basically, credit unions are known for friendly faces and low rates. A few years ago my husband was buying a car and needed to take out a $5,000 loan. Instead of doing it through a dealership or private lender, he chose to use his local credit union. I was shocked when I saw how low his interest rate was. My credit was better than his, but I still received a much higher interest rate for my car loan when I got it through a dealership. Lesson learned. Differences aside, a key point to remember when considering banks vs. credit unions is this: your money is relatively safe with either institution. A commercial bank offers Federal Deposit Insurance Corporation (FDIC) coverage, and a credit union offers National Credit Union Share Insurance Fund (NCUSIF) coverage. Both programs are federally insured, offering the same $250,000 per account coverage. Traditional commercial banks are on almost every corner, making it quite simple to get cash. If you’re traveling or need cash quickly and use a major bank like Wells Fargo, Bank of America, or JPMorgan Chase, you won’t have to go far to find a branch. You can even utilize their different ATM locations when the bank is closed. Most traditional banks also offer convenient tools like online banking and mobile apps so you can manage your account on the go. Large banks have the client base necessary to create these conveniences. Expect smooth online operations at big banks. The one downside to large commercial banks is that they can be very impersonal. You may be subject to long lines and may never get the same teller twice. You may even do all of your banking online, removing the personal touch altogether. This isn’t bad, per se, as it depends on your needs. If you’re simply looking for an institution that makes saving money easy and have little need to go into a branch, an online bank might be all you need. While credit unions may not be located on every corner, they have a more personalized approach and generally get to know their customers. At a credit union you feel more like a member. You have more of a say in what type of service and experience you want. When it comes to getting a loan, credit unions are typically more lenient and willing to work with you. They take the time to understand the financial factors that don’t show up on paper. However, credit unions operate on a smaller scale than traditional banks and run fewer branches with stricter hours of operation. This may be an inconvenience for those who live far from their credit union or work late hours. Credit unions generally offer fewer fees and better interest rates for savings accounts. The National Credit Union Administration regularly averages the rates offered by credit unions and banks and then compares the two to see which one is higher. According to their latest report, federal credit unions offer higher rates for CDs, money market accounts, and savings accounts. They also have lower rates for loans. However, credit unions are not leading by not by much. While traditional brick and mortar banks’ savings rates are at an all-time low, choosing an online bank gets you the same competitive interest rates for your checking and savings accounts. Check out our review of CIT Bank to see what they have to offer. Their money market, for example, pays 1.85 percent (15x the national average) and requires a minimum account balance of just $100. Most traditional banks have a long list of rules and requirements when you open a checking account. It’s important to read the fine print to ensure that you aren’t overpaying by getting charged a monthly fee, multiple withdrawal fee, or any outlandish overdraft fees. At a credit union, there is less of a chance that you will get stuck with fees because, unlike banks, these institutions do not rely largely on fee money for profit. pros and cons: bank vs. credit union – Which is Better? 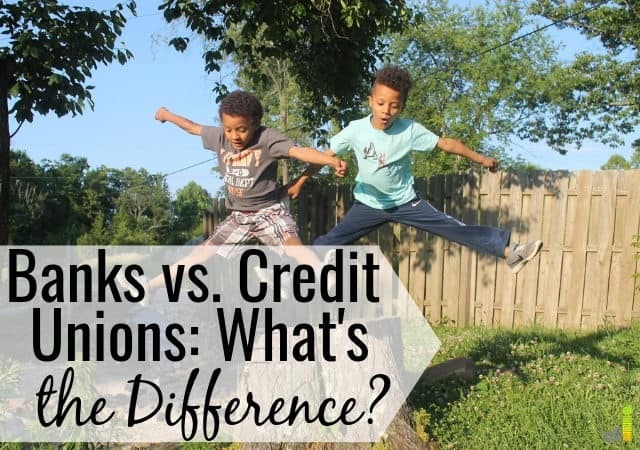 We’ve discussed the differences between banks and credit unions in detail. Below are the key pros and cons for both financial institutions. The answer to the age-old question of bank vs. credit union and which is better for your money depends on what you value: saving money or convenience. If you are looking for convenience, easy access to your money when traveling, superb mobile banking tools and a wide variety of credit card programs, you may prefer to use a traditional commercial bank. Just remember to thoroughly read through the agreement and ask questions about any hidden fees before opening an account. If you don’t require the convenience of multiple locations and prefer a more member-focused institution with lower fees and better interest rates, you should consider a credit union. Regardless of your decision, it’s important to do your research and read the fine print before opening an account with either type of institution. What are your thoughts on credit unions vs. banks? Which institution do you tend to prefer? How closely do you pay attention to rates and fees when choosing a financial institution?